A beautifully crafted work of art that needs no electricity yet makes the perfect expresso! For coffee lovers with a conscience. This product rightly deserves all the awards it has won. It is manufactured from high quality steel and guaranteed for 10 years. 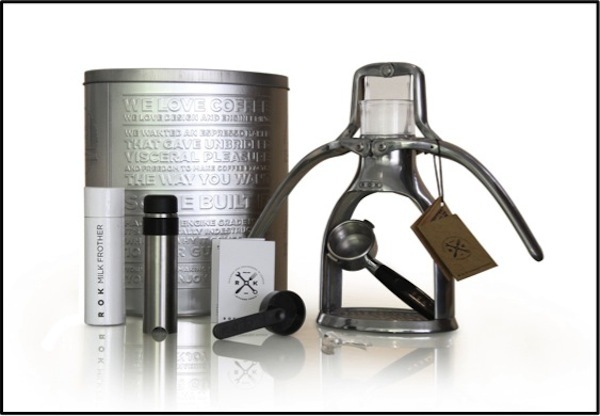 The ROK manual exprosso maker is a joy to use and you can feel the pleasure in every coffee you make. Download this ROK Information Pack to find out more about the ROK Expresso Kit. If you buy the Frontier Stove and water heater from our website you will be able to make perfect coffee anywhere!